The Virginia Discovery Museum fosters intellectual curiosity and development for all children of our community. The Virginia Discovery Museum envisions a future in which all children in our community are inspired to be lifelong learners. We seek to be a vital community resource where children from economically and culturally diverse backgrounds explore, imagine and discover together. Educational: Our Educational Advisory Committee, consisting of staff and board members, as well as local educators, drives all of our content creation, from exhibits, to events and programming. Our offering is designed to be scalable for all learning levels and corresponds to the Virginia Standards of Learning. Inclusive: We are a resource for all the children of our community, as we understand that children learn best in a diverse environment. We seek to meet the interests, needs and abilities of all the children we serve, and to create an environment in which differences are celebrated. Child-Focused: We exist at the intersection of learning and play, where children learn through hands-on experiences and imaginative exploration. We offer high-quality exhibits, events and programming in a clean, safe environment. Community-Based: We collaborate closely with local schools, social service agencies, cultural institutions and governing groups to ensure that we are meeting the needs of the children of our community. Through our Free Admission Program and Camp Scholarship Fund, we make the museum and our programs accessible to all. The Virginia Discovery Museum (VDM), an independent non-profit 501(c)(3) organization, is an interactive, educational museum for young children. VDM was established in 1981 to organize a group of traveling exhibits throughout Central Virginia. As the popularity of the programs increased, the Board of Directors resolved to find a permanent home for the museum in Charlottesville. 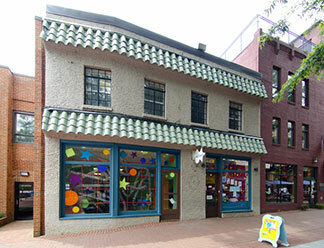 Located first in a two-story house, VDM quickly outgrew its space and in 1990 moved to its current location on Charlottesville’s Downtown Mall. In addition to creating new exhibits, VDM established a variety of on-site educational programs and special events for children and families. As part of its commitment to the Charlottesville community, VDM also increased outreach to low-income families, expanded operating hours, forged a closer relationship with area schools and educational institutions, and participated in community-wide tourism and economic development efforts. Today, VDM welcomes visitors from across the country and across the world, but remains at its heart a local institution for the local community.